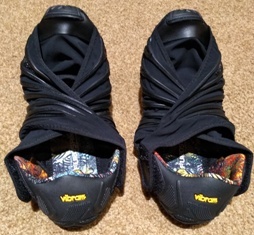 The Vibram Furoshiki Shoes are a uniquely-designed pair of minimalist footwear. The upper is 28% Elastane (Stretch Rubber / Lycra) and 72% PA (polyamide & nylon). The fabric wraps around from each side near the toe to the opposite side and attaches with hook-and-loop closure. Between the stretch of the fabric and the adjustment in the attachment point, there is quite a bit of flexibility in fit. The sole is a rugged but lightweight low-density Vibram outsole. 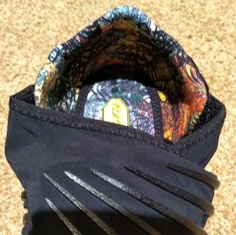 The outsole wraps up the sides and around the front of the toe creating an integrated type of foot protection. The sole has a good grip and is flexible enough to fold in half. The Furoshiki came in their own storage drawstring pouch which requires the shoes to be folded in half to fit inside. 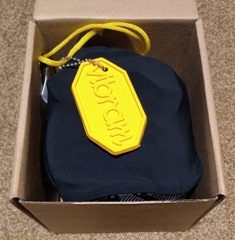 Attached to the drawstring is a Vibram rubber logo (like on their outsoles) which is a key chain. Cool. My initial impression was surprise to find inside the shipping box a small square box which was about 1/4 the size of a shoe box. Huh? Inside the small box I found a nylon carry bag with two shoes inside which were folded in half. Ok, these were already the most unique shoes I'd ever seen even before I took them out the bag. To try them on, I unfastened the hook-and-loop from both sides which opens up two wrapping wings. Underneath is what looks sort of like a ballet slipper with a nylon cover at the toe and a fairly substantial back. I slipped my toe under the toe box and wrapped the sides to what seemed like a comfortable snug fit. I tried them with the thin athletic socks that I was wearing and found the fit to be a little large. I was able to wrap the wings tightly around my foot though so that there wasn't movement. The wrap and hook-and-loop closure system allow for quite a range of adjustment. I also tried wearing the Furoshiki barefoot and found them to be too large. I was considering exchanging them for a smaller size but I don't really like to wear shoes barefoot. The feel of the materials against my feet just isn't comfortable to me and these shoes are no different. So, then I tried them on with my typical lightweight hiking socks and they fit nicely. This is most likely what I'll be wearing on the trail when I'm in camp and want to wear the Furoshiki. So, in the end I decided to keep the size I have. The shoes are very light and flexible making for a comfortable slipper-like experience. I can immediately feel little support and little cushion which is typical of a minimalist shoe. They feel more like being barefoot but with nice sole protection and top coverage. Washing instructions say to wash in cold water and drip dry. Additional details on the website say to hand wash or machine wash on gentle cycle in cold water with detergent and air dry. Simple enough. They also have a warning that hot wash water or machine dryers will likely ruin the shoes so be careful. 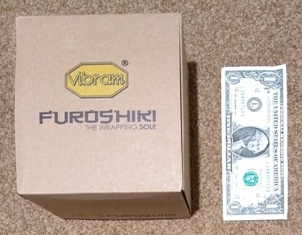 The warranty on Furoshiki shoes is a 100% satisfaction guarantee if the shoes are purchased at full price and returned within 6 weeks of purchase. No questions asked. Defective material is warranted for 90 days after purchase. 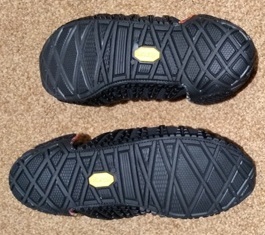 The Vibram Furoshiki Shoes are a unique pair of lightweight shoes that wrap the foot with nylon and have a rugged but flexible outsole. Too little protection in camp? 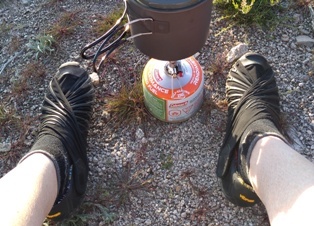 I wore the Furoshiki Shoes during multiple short backpacking trips, for car/base camping and for short day hikes and nearly daily around the house and for walks. 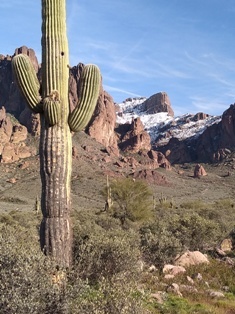 Arizona trips ranged from 1,500 to 4,100 ft (450 to 1,250 m) elevation; 38 to 72 F (3 to 22 C) with clear to cloudy conditions. The shoes are so comfortable that I found myself wearing them almost daily in the house as slippers. They are so light that they almost feel like I'm not wearing any shoes at all. 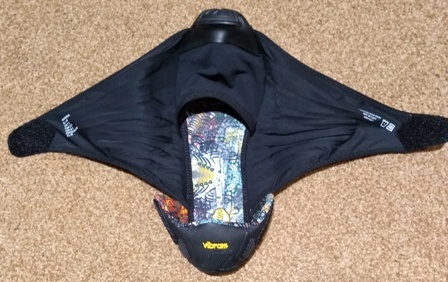 So, at first, when I'd head outside for firewood, onto the deck or to the garage I would feel like I need to slip on shoes...forgetting that the Furoshiki have a Vibram sole! It was so nice to remember that and realize that these shoes are solid and rugged despite their whisper-light feel. That evolved to just leaving the shoes on and wearing them during our home remodeling project with frequent trips to the garage and outside. I would leave them on for walks down at our local riverside track. Throughout the test I wore the shoes mainly with light hiking socks. I occasionally wore them in the house without socks. But even as slippers, I preferred to wear socks with them probably due to their being slightly large for me. I took the shoes on many short backpacking trips as camp shoes and wore them for car camping and on short day hikes. They worked great for keeping my feet protected. The uppers are very thin so any sticks or rocks would definitely be felt but my feet stayed covered. The only time I chose not to wear them in camp was when we were too close to many cacti. I was afraid that a nighttime potty break might be dangerous. The shoes did a great job at keeping out small rocks, debris and decomposed granite. I found that after a few miles of hiking that my feet were fairly tired so I ended up adding some more substantial insoles. This allowed me to wear them for longer mileages in rougher terrain. The soles were grippy and I could count on them to not let me slip on rocky surfaces even when there had been rain and everything was wet. After the desert trip, the Furoshiki were looking pretty dirty and trashed so I didn't want to wear them in the house like I had been doing prior to the trip. So, I threw them in the laundry along with dark items and washed them in cold water. They came out looking new! I let them dry just sitting out. I found that I didn't use the storage sack that came with the shoes. I didn't really find a sack necessary and I didn't like having the shoes folded in half which is necessary to use the sack. Keeping them folded in half for any amount of time seemed to make the toe want to curl upwards reminding me of some kind of elf shoes. I found my doing the opposite and keeping the hook-and-loop loose so that I could fold them backwards or at least keep them flat. It seemed to help but the toe still wants to curl upwards probably somewhat because the shoes are a bit too long for me. One thing that I really appreciate about these shoes is that they could serve as hikers in an emergency situation. If I'm going to carry extra shoes on the trail, I want them to serve as water shoes, camp shoes and emergency shoes. Granted, I wouldn't want to hike too long in these but these provide needed protection. With them being slightly oversized for me, they also allow for room to insert an insole which would extend the mileage that I could hike in them. The durability has been fantastic so far. These shoes have gotten a lot of wear and despite their lightweight uppers, there are no detrimental effects to the fabric. The soles are looking great. The hook-and-loop closures are still holding fast. This concludes my Field Test Report. Please check back in two months to see how these shoes finish up the test. 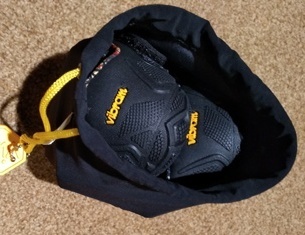 Thanks to Vibram and BackpackGearTest.org for the opportunity to test out these unique shoes.